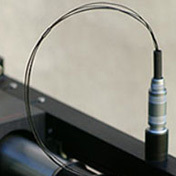 High Quality Lemo Connectors: The cartridge signal passes from the arm-tube to the main housing via custom high quality Litz arm wire. The wires are terminated at a precision miniature Lemo connector using professional grade, gold plated contacts. Air - Beam: The air - beam with the laser cut micro perforations is the source for the tiny airstreams used to create the air bearing for the sleeve assembly. To maintain the required accuracy and stability the air-beam is manufactured from titanium to an extremely tight tolerance. The laser cut micro perforations are so small that they are invisible to the naked eye. Air-Bearing Sleeve: Ultra high precision aluminium air-bearing sleeve. It is extremely rigid and light. The air-bearing sleeve is build for exceptional stability and zero friction. Even with the air supply turned off the arm appears to have negligible play with respect to the air-beam, so close are the manufacturing (sub-micron machining) tolerances. The arm-tube is attached to the sleeve. 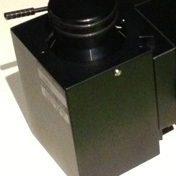 A sliding counterweight on the opposite side of the air-bearing sleeve balances the cartridge and the arm-tube to provide the required VTF. 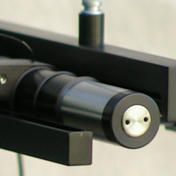 Three different counterweights are included for optimum performance with all cartridges. The air-beam is suspended only at one end, the other end is free, allowing the air-bearing sleeve to be easily slid off. 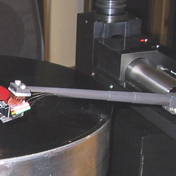 Whole tonearm assemblies, may be changed over if more than one cartridge is to be fitted, as each can be individually set and counterbalanced. Arm-Tube: Damped Carbon-fibre arm-tube fabricated using aerospace high-pressure laminating techniques, drastically eliminates the resonant colorations. Arm-Tube Clamp: The arm-tube is held in place by a rigid clamping system protruding from the airbearing sleeve, which allows for easy azimuth and overhang adjustment. 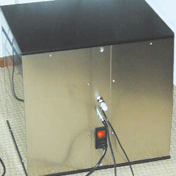 The settings are locked in place by a precision azimuth screw adjustment system. Main Housing: The massive main housing is actually in two parts. One half is stationary and bolted to the armboard. 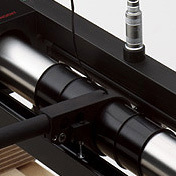 The other is free to move vertically and acts as a central coupling point for all the components comprising the tonearm. The two pieces are accurately linked by a vertically aligned linear bearing, and can be moved with respect to each other providing a fine-pitched, rock-solid, smooth and continuous VTA adjustment system.